One of my earlier posts regarding non-drug pain management was about nutrition. In today's post we see an example of this. 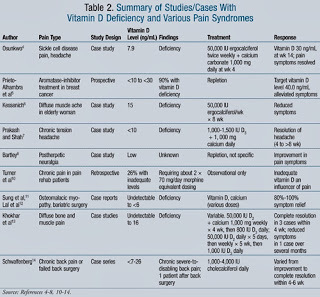 In an July 2012 article in US Pharmacist, the link between chronic pain issues and vitamin D deficiency were explored. The table below was posted in that article. As you can see, there have been a good number of studies linking various chronic pain syndromes to this problem, and in almost every case repletion of vitamin D produced positive results. If you have reason to believe that your vitamin D levels may be subnormal---don't hesitate to ask your doctor about checking your levels. This is not a rare problem in the current day and age, and if it turns out that you, too are affected, a little vitamin d supplementation may be just the ticket!